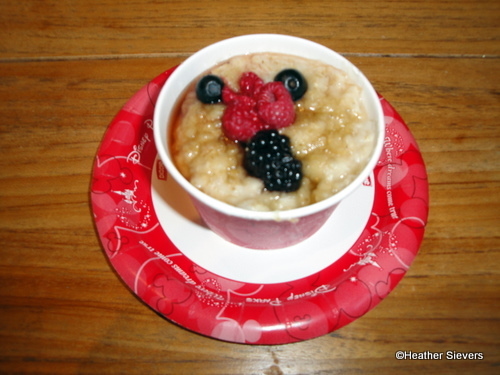 Our Dining in Disneyland columnist, Heather Sievers, shares breakfast with her family — and a guest! 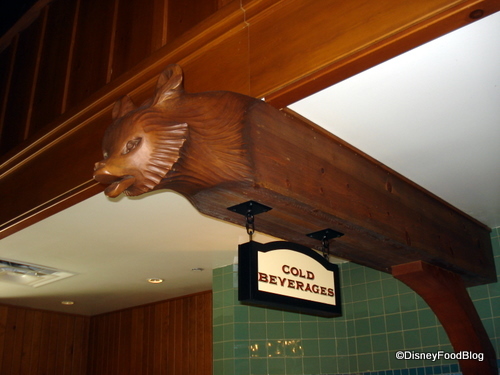 — at White Water Snacks in Disney’s Grand Californian Resort. 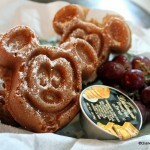 Looking for a tasty, quick, and affordable breakfast while staying at the Disneyland Resort? 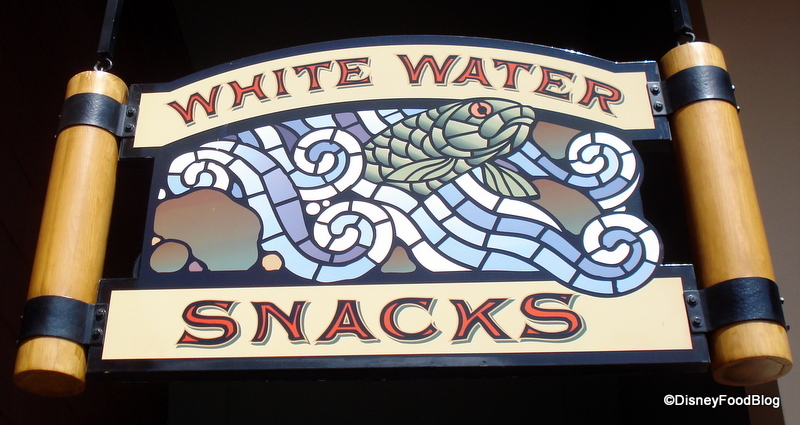 Head over to White Water Snacks at the Grand Californian and you won’t be disappointed. 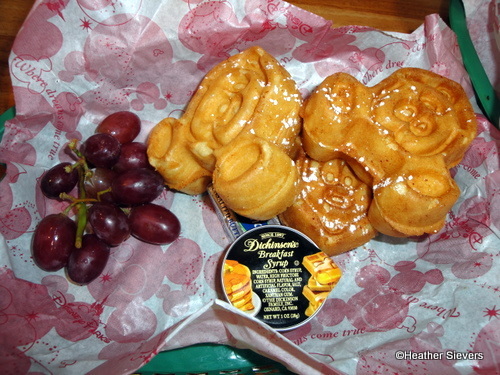 My family stays at the Disneyland Resort a few times a year, and when we do, we always have at least one breakfast at White Water Snacks. 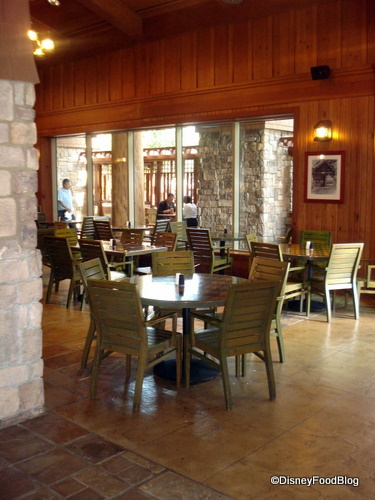 The atmosphere is very casual; it’s walk up with no table service. You can order hot or cold meals, you pay the cashier, you’re given a number, and when your meal is ready, they bring it out. 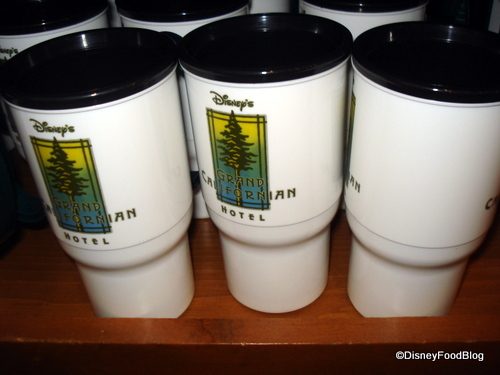 Although the restaurant is located on Grand Californian property, it is directly next to the Redwood Creek Challenge Trail, which makes you sort of feel like you are inside of California Adventure! 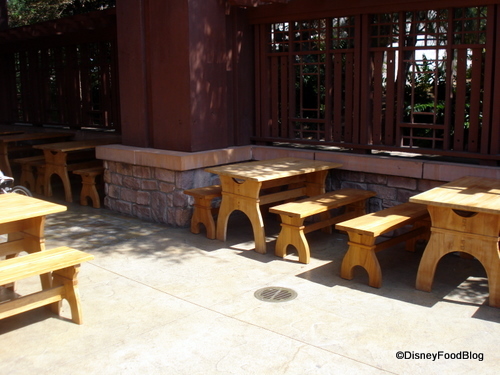 White Water Snacks has both indoor and outdoor “picnic” table type seating. We love to sit outside for a few reasons. First, we enjoy the feel of being in the wilderness right in the middle of Anaheim. Second, it makes the restaurant seem less “cafeteria” like. AND Third, we get to visit “Hobo” kitty! Yes, I said Hobo Kitty*. Right on the other side of the restaurant there are a ton of trees and bushes. In them lives the infamous Hobo Kitty, a cute calico cat who lives the life of roaming California Adventure by night and scrounges for food at White Water Snacks during the day, or at least during breakfast hours. We’ve been seeing him there for over a year and a half. As far as food goes, it really is pretty good, especially for the price. 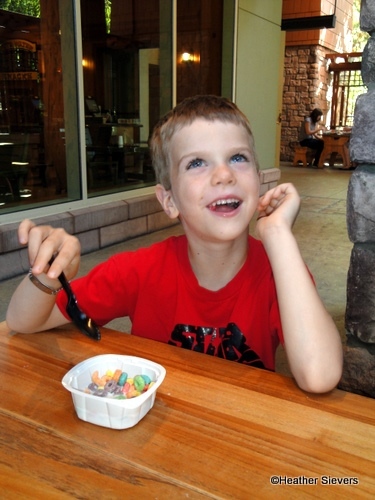 I had the Oatmeal with berries and brown sugar, my husband had the California Breakfast Burrito, my oldest the Mickey Waffles, and my youngest went with the oh-so-cute mini box of fruit loops and a side of bacon. The four of us ate for under $25! If you’re looking to go directly into California Adventure after breakfast (you MUST already have park tickets or annual passes), there is an entrance just a few steps away from White Water Snacks. Once in a while the entrance is deemed for “hotel guests only,” but we have used it on multiple occasions without having to show a room key. Just let the cast members know that you dined in the hotel and it shouldn’t be a problem. 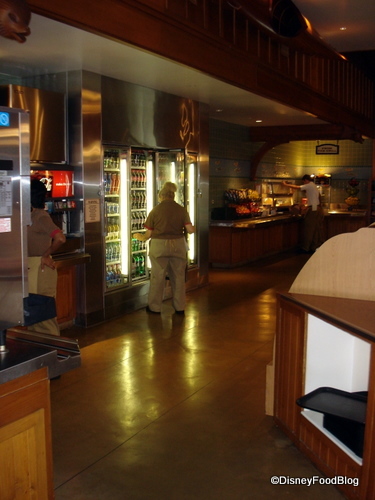 Although this post is a “breakfast only” review, White Water Snacks also serves hot lunch, snacks, baked goods, various fruits and veggies, hot/cold beverages, pre packaged sandwiches and more. Peak season hours are 6:00 am to 10:00 pm. Off season hours are Sunday to Thursday 7:00 am to 7:00 pm and Friday to Saturday 7:00 am to 9:00 pm. Of course hours are subject to change at the resort’s discretion. *Disneyland is known for its feral cat population, which is kept steady by the parks’ animal wranglers (spaying and neutering adult cats and finding homes for kittens) and encouraged to help control the rodent population! You can see more about the kitties in this LA Times article. 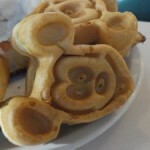 The Mickey waffles at DLR are just awesome. For my birthday last year I got a HUGE one and it was seriously the best waffle I’d had. My mom and husband kept trying to steal it. The interior to the building looks quite nice, and possibly the farthest from a cafeteria feel than I’ve ever been in. 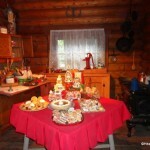 They do use quite a lot of wood in all the decor and such. Hobo Kitty is beautiful! Thank you for posting her picture. (Calicos, due to the laws of geneticS) are always female). 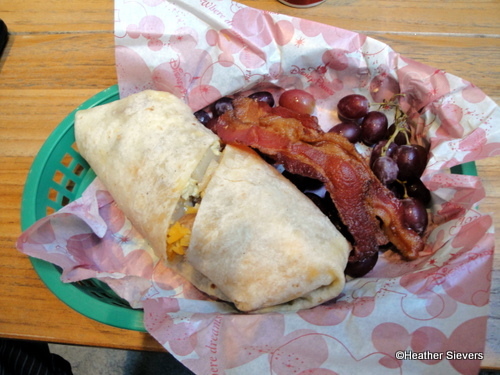 That breakfast burrito is definitely on the list for my next trip. Their chicken salad sandwiches on croissants are quite good as well. I love the little cats that live around there. They are adorable. Also, for lunch and early dinners, this place makes the best nachos I’ve ever had. HANDS DOWN! I also like it because I can eat there first and get right into the park after eating there. Recently because of World of Color they have been checking my receipt, though I don’t know how consistent this has been. Just a heads up to make sure you keep your receipt from eating there. @Elaine-We made up the name Hobo Kitty : ) It has a “real” name but I can’t remember what it was. Next time we’re there, I’ll find out! The cast members know all about each cat. There is another one that hangs out there too, but it is much more shy. 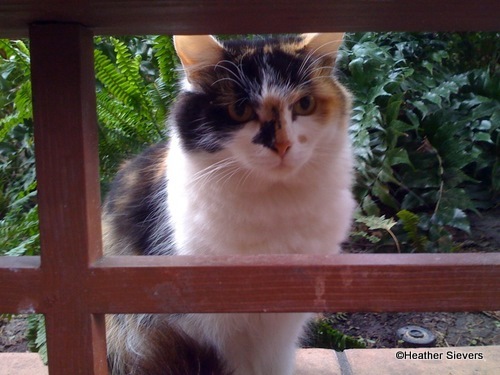 @Cherie-I had no idea about Calico cats being only female, interesting! Another nice review from Heather. When all the reconstruction is done there, I see a western trip in my future. I like the idea of domestic type pets running around the Disney properties. @Alan- Thanks! Let me know when you’re out here! For sure wait for the construction to be done. CA ADV is a mess right now. Hobo cat!!! How cute! I’m glad Disney allows these cats to stay on property. I wonder if they’re there, to, um, keep some welcomed critters out of the way? I hope they get veterinary care. BUT! 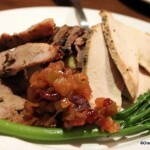 i have heard a ton of fabulous things about this eatery and have yet to dine there! I keep forgetting about it…. gah! I will have to remember this one as a place for b-feast/lunch next time for sure. Thank you for the report!! !